/BigMIND /Partners 2.0 (BigMIND) /As a White Labeled Partner of BigMIND, Can I Create Trial Accounts for my Clients? 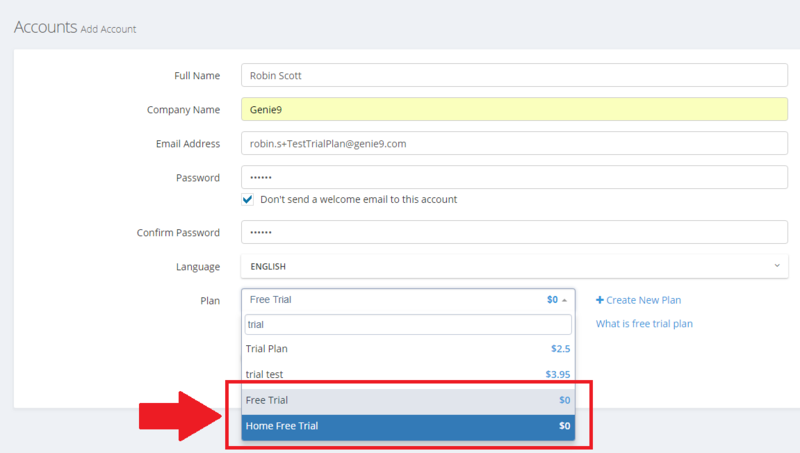 Yes, the Partner system allows you to create trial accounts for your end users (Clients) for free, as it provides a ready-to-use plan called Free Trial. It can be assigned to only ten (10) active accounts. It cannot be extended, renewed or deleted. It gives the user a 14-days trial period to try the service for free. 10 GB of Hot Storage. 10 GB of Cold Storage. SaaS is enabled by default. 2 GB of Hot Storage. On the left-hand pane, click on Accounts. Full Name: The client’s name. Email Address: The client’s email. Password: You can specify a password for the user’s account. This is optional and if you leave this field blank, an email will be sent to the client to ask him to set his own password. Confirm Password: To confirm the password if you specified one. Plan: From the drop-down menu, select the Free Trial plan if you want to give this account a Business trial account, or select the Home Free Trial plan if you want to give this account a Home trial account.